The conference room inside a Veterans Affairs center in Nashville feels distinctly clinical: beige walls, gray carpet, creaky chairs. But on a Monday afternoon in August, there’s an energy that might be felt more often at an intimate Nashville club. Two dozen people, mostly women, are sitting on those creaky chairs in a circle. Some hold guitars. About half are veterans, and they’re waiting to debut their very personal songs about a shared experience: sexual assault. Thousands of women in the military report being sexually assaulted each year — and it’s a number that’s rising. When those women return to civilian life, some seek counseling at a local veterans affairs clinic. 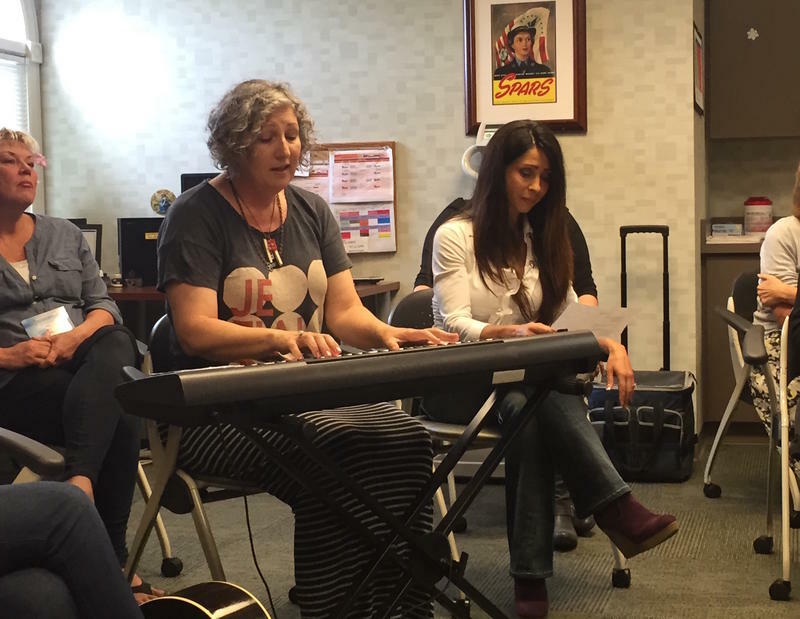 But Nashville’s VA now offers a supplemental therapy inspired by Music City: a program that pairs survivors of sexual assault with songwriters, who help put their stories to music. The program ends with this day of performances by the veterans and songwriters. Sarah Kelley, a 33-year-old Army veteran, explains the back story of her song to the rest of the room. Kelley used to sing and write songs, she says. That hasn’t happened since her assault. She puts in a CD of her recording — a song called “Find Your Voice” — and sings along. The songwriter she was paired with strums behind her. Kelley was assaulted 14 years ago, but she says she still has nightmares. Sometimes she hallucinates there’s someone in her house. She’s also often afraid to leave her house alone, she says, which posed a problem when the songwriter she was working with asked her to come over to record their song in his studio. Kelley forced herself to go over. He got the idea while performing on military bases as part of an armed forces tour: He realized his decades as a songwriter had turned him into somewhat of a therapist. “It’s our job to make the person sitting across from us feel safe and encouraged to open up. That’s just a skill set you attain,” he says. Nashville songwriter Marie McGilvray accompanies Marine veteran Ann Hubbard. But he admits, it takes a different skill set to sit down with a veteran in Operation Song than to sit down with another songwriter on Music Row. Some veterans have a harder time opening up, he says, and when they do, the stories they share are likely to be much more traumatic. Katy Minton was 19 years old and serving in the Air Force when she was sexually assaulted by a colleague she had dated. Traditional therapy has helped her get through an eating disorder and some of the aftermath of the incident 11 years ago, but the songwriting process adds an extra layer of accomplishment. “It’s really cool to see how far I’ve come and to put that into a song,” she says. “Dear Me,” written with songwriter Victoria Banks, is a letter to herself as a little girl. Banks sings the song in the conference room. Minton sits across from her quietly, with tears in her eyes. The 10 or so women in the program each year are chosen by counselors like Michele Panucci, the Nashville VA’s sexual trauma coordinator. The veterans have to be ready to talk about their traumatic incident with someone who’s not trained as a therapist, she says, although there’s always a therapist nearby during their songwriting sessions. The results have been humbling, Panucci says. Some of her clients opened up during their performances in ways that they haven’t even done with her. After the performances, the veterans and writers grab snacks and congratulate each other. Bob Regan walks over to Sarah Kelley. Kelley grins. Yes, she says, she has much more to say.